Whether its Portugal during economic crisis or New York’s Hamptons during a boom, travelers on holiday are always a favorite source of revenue for local authorities looking to fill the city’s coffers. British motorists visiting Portugal have been warned to expect little leniency from the country’s traffic police, with seemingly trivial offences attracting large fines. 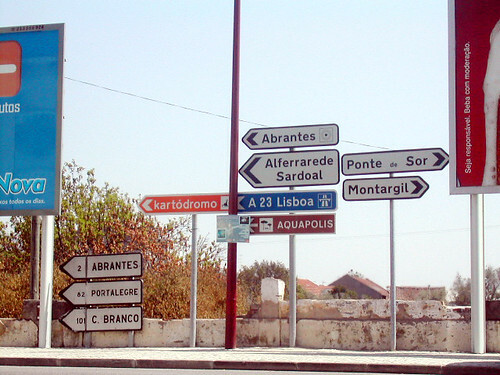 Road signs in Portugal. Photo by stefano. Earlier this year Portuguese media reported that the country’s National Republican Guard (GNR), which enforces motoring laws, had been told to increase their annual revenue from traffic fines, to help support the country’s ailing economy. Offences such as parking against the flow of traffic, and driving while wearing flip-flops, have reportedly attracted fines in excess of €200 (£160), while the GNR has been accused of targeting overseas tourists in order to meet its targets. One British resident of the Algarve, who asked to remain anonymous, was stopped by police while driving last month. Although her paperwork was in order, she claims that authorities were only pulling over foreign-registered cars, and says she saw an elderly British couple having their vehicle confiscated. Another expat reported seeing several UK-registered cars clamped outside a supermarket in Albufeira, despite no sign prohibiting parking. He claimed that tourists were seen as a “soft target” as they tend to pay, and get on with their holiday, rather than contest the fines. Meanwhile, a shopkeeper in Guia claimed that foreign motorists in the town had been targeted using a law that requires drivers carrying commercial loads to possess a document of ownership. Drivers had been fined, he said, after visiting a supermarket and then being unable to show police a receipt. The Foreign Office warns that “fines for traffic offences are substantial in Portugal”. It adds that police will carry portable ATMs in their vehicles to facilitate immediate payment of on-the-spot fines. A spokesman for the Automobile Club of Portugal said it was “struggling with the government” over the issue, adding that it was “certainly not good for tourism”. Authorities in Portugal were criticised earlier this year following the introduction a controversial road toll on the Algarve’s main motorway, the A22.